You can use it to tow water skis, or you can use it to tow trolling baits. Dual consoles are excellent multipurpose boats, and the Sailfish 245DC is a perfect example why. It has the seating capacity for a dozen people to kick back and chillax, yet it also has the livewell capacity for dozens of live baits to mill around and wait for the ax. You can use it to tow water skis, or you can use it to tow trolling baits. And thrill rides are not a problem, whether you’re running the kids across the Bay for lunch or the buddies to the next hotspot. 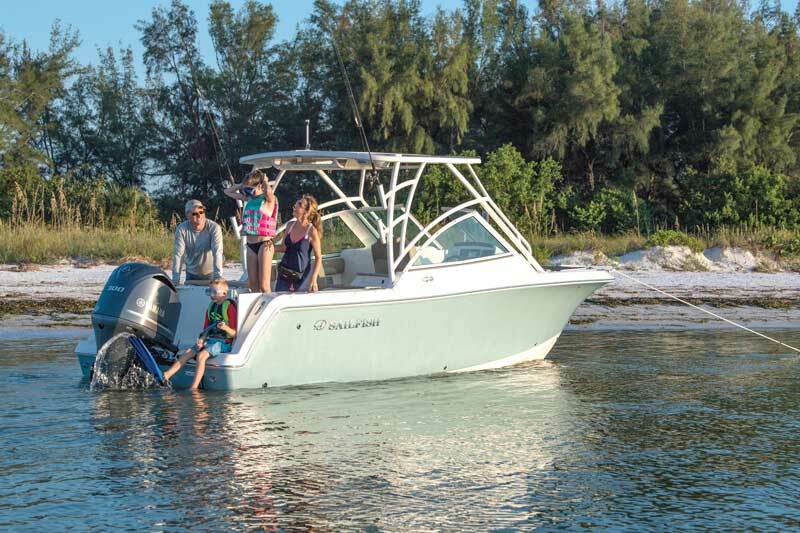 True, serious anglers won’t get the 360-degree fishablity of a center console, but short of that one trait the 245DC doesn’t miss a beat, fishing-wise. The livewell in the corner of the transom holds 25 gallons, is lighted, dogs down tight, and has a clear lid for viewing the baits. The transom sports two flushmount rodholders to complement the pair in the gunwale, and there are four more on the hard top supports. Coaming bolsters line the cockpit. The fishbox in the deck is big enough to stow (almost) any striper, and while most folks will use the bow seating compartments for dry stowage, they are insulated and can be used for fishboxes as well. On the flip side of the coin, yes, you non-fishers may have to put up with ducking under a swinging rod or two and the possibility of a slightly aquatic odor coming from that fishbox. But this boat does also carry virtually everything you could want for a day of waterplay. A glimpse at the transom says it all, where those flush rodholders bracket a pop-up ski tow pylon. You’ll also appreciate the Fusion stereo system with four speakers and USB port (you can upgrade it to get a 10-inch subwoofer, a transom remote, an amp, and lighted speakers), the in-deck ski and tow-toy locker, and the 15—count ‘em, 15—strategically placed cup holders. And yes, of course there’s a head compartment built into the passenger’s side console. Sailfish also offers a few features which might be considered a bit opulent on this boat. You can, for example, order it with misters built into the hardtop. That’s not exactly like outdoor air conditioning, but it comes darn close. You can also order blue underwater transom lighting. Or what the heck, go ahead and spec the boat with the Galley Pack, and get a 12-volt refrigerator. A built-in solar house battery charger can even be integrated into the hardtop. 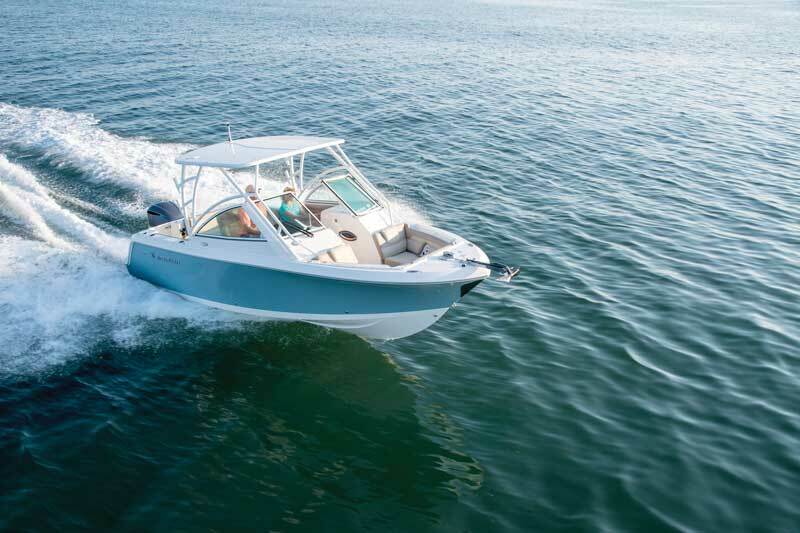 Power options range from a single 200- to a single 300-horsepower outboard. Power options range from a single 200- to a single 300-horsepower outboard, in either Yamaha or Mercury flavors. For most of us any of these power choices will do the trick. But, what if you want those thrill rides to be really thrilling? Then, naturally you’ll opt for the maximum power. With a single Yamaha F300 on the transom most efficient cruise comes at around 4000 rpm, where the boat gets a hair over 2.5 miles to the gallon while running at 30 mph. The 245DC will cruise in the mid-30s at around 4500 rpm, while losing a few tenths of a mpg. Nail the throttle, and you’ll see a top-end in the 48-mph range. How’s the ride at these speeds? Sailfish has a rather unique hull design with a deadrise that varies not fore and aft, as is usually the case, but instead from the centerline out. As you move away from the keel and out toward the chine, the V progressively drops in sharpness in three different increments. They’ve been using this design for years, and as anyone who’s been on a Sailfish can attest, the design works well. You need a multipurpose, do-everything boat? The Sailfish 245DC might just be the perfect pick. Just make sure you don’t mix the bait in with the beverages, please.